Since the introduction of its legendary stand mixer in 1919 and first dishwasher in 1949, KitchenAid has built on the legacy of these icons to create a complete line of products designed for cooks. Today, the KitchenAid brand offers virtually every essential for the well-equipped kitchen with a collection that includes everything from countertop appliances to cookware, ranges to refrigerators, and whisks to wine cellars. This year marks the brand’s 10th anniversary of Cook for the Cure®, a partnership with Susan G. Komen for the Cure® that has raised over $8 million to help find a cure for breast cancer. 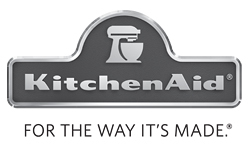 To learn why chefs choose KitchenAid for their homes more than any other brand, visit KitchenAid.com.